Where Do Federal Law Enforcement Professionals Train? If you're at all interested in exploring careers in law enforcement with the federal government, you need to know how and where to train. No matter what federal agency you end up choosing to work for, the probability is high that at some point in your training, you'll make your way to the Federal Law Enforcement Training Center in Glynco, Georgia. Before you get there, you'll want to know what it's like and what to expect. The Federal Law Enforcement Training Center - more commonly called FLETC (flett-see) by law enforcement professionals - has several satellite campuses around the United States, but the main campus and headquarters is located at the former Glynco Naval Air Station in Georgia, just north of Brunswick and between Savannah, GA, and Jacksonville, FL. The Federal Law Enforcement Training Center was established to standardize training across federal law enforcement agencies. Prior to its creation in the 1970s, each agency was responsible for its own training, leading to inconsistencies and varying standards within the federal law enforcement community. The original plans called for the center to be located in Washington, D.C., but construction delays prompted planners to explore new sites. Glynco was the home to the U.S. Navy's fleet of airships (blimps), which monitored the east coast for German submarines and warships during the height of World War II. In 1975, it was transformed into the training campus it has become, and FLETC has been based there ever since. While a select few agencies still host their own academies, most federal agencies send their trainees to Glynco. The Federal Law Enforcement Training Center programs are very similar to other police academy training programs. Generally, students are required to live on campus for the duration of their training program. Trainees participate in an extensive physical fitness program and are subject to dismissal if they're not up to the physical standards. Trainees' days, as are the cases for most police recruits, are very busy. 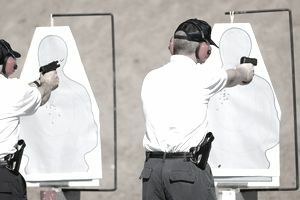 Students will split their time in classrooms, computer labs, and on the driving, firearms and defensive tactics ranges, where they learn the ins and outs of the skills and knowledge needed to work in law enforcement. Typically, trainees will spend up to 6 months at Glynco. While there, they not only train hard, but they also have the opportunity to play hard. FLTEC at Glynco offers activities for students during their leisure time. They also host a student recreation program which includes attending sporting events, golf outings, horseback riding, and concerts. No matter the career path you choose, if your plans include working anywhere within the federal law enforcement system, you're more than likely going to end up at FLTEC. Be prepared for long days in the Georgia heat while gaining valuable knowledge and skills that will remain with you throughout your career. While you're there, take advantage of the various programs that FLTEC has to offer, and make the most of your unique law enforcement training experience.